I came across two interesting characters making bicycles using bamboo frames and I share both with my readers. The first one is from Ghana and this article will give you all the information on the contraption. The next one is an Indian and you can see his story in this youtube clip. This entry was posted in Uncategorized and tagged Ghana, India, Innovation. Bookmark the permalink. 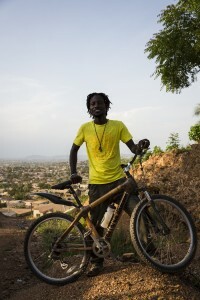 19 Responses to Bamboo Bicycles. This is creativity at its finest! It is. I was particularly impressed with the tests that the Indian one went through and survived! i love entrepreneurs! especially down to earth hands on ones! beautiful. True. Among them, the used plastic bags for road construction offers great scope. We call that jugaad here John. And those Bamboo bikes look gorgeous too. Very refined details. I love it when human beings get creative and their creativity is one of things I love the most about our brothers and sisters. Your post shows something very beautiful too: worlds apart, different backgrounds, yet brilliant minds remain the same. This post is a true ode to human beauty :). How true! One in Africa and one in India, but coming up with similar ideas. Non hollow bamboo poles can be very strong indeed. In South and East Asia, Lathi a heavy pole or stick, especially one used as a club by police is usually of such bamboo. They are stronger than the batons used by Western police and don’t break easily.